'Tis the season when top destinations and family resorts are decking their halls and making the season merry and bright. With children around the country enjoying as much as two weeks of school holidays, many families will turn Christmastime into an opportunity for a vacation. Thinking of heading to Orlando during the Christmas season? From Disney World's Mickey's Very Merry Christmas Party to Holidays at Universal Orlando Resort, America's no. 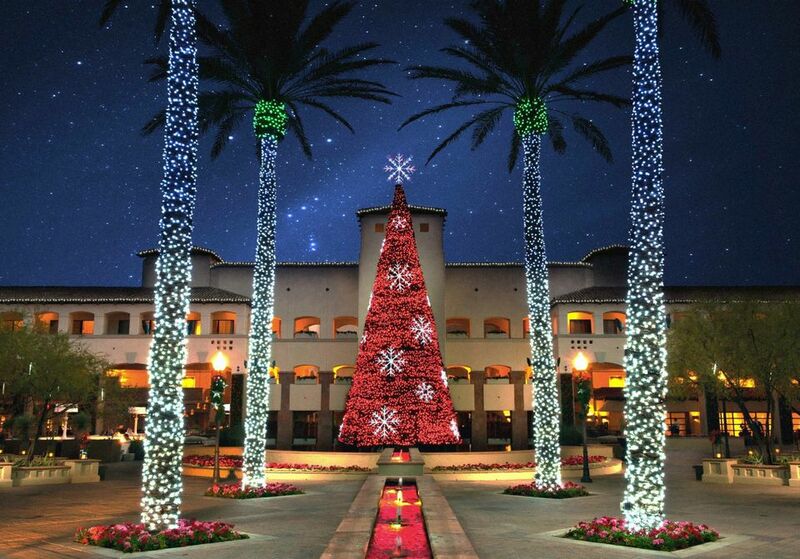 1 family destination decks the halls and pours on the cheer during the Christmas season. But Orlando offers more than Disney and Universal. Find out how Christmas is celebrated at Orlando's biggest resorts and theme parks. The magic of Christmas exists for those who believe. That’s the theme of The Polar Express, the beloved children's book, and a popular holiday movie. Over the past decade scores of Polar Express trains have popped up all over the country, offering families the opportunity to recreate the magical Polar Express experience through readings of the story, music from the movie soundtrack, cups of cocoa and, of course, meetings with Santa. Very Merrytime Cruises take place on most voyages aboard all Disney Cruise Line ships from late November through early January. Available sailings range in length from three to seven nights with itineraries to the Caribbean and Bahamas, including Castaway Cay, Disney's private island. Onboard, families are treated to special activities, events, entertainment, food and beverages, and other holiday festivities. Voted the No. 1 Kid-Friendly Resort in the Eastern US & Canada by SKI Magazine readers, Smugglers' Notch Resort in northern Vermont can enjoy a variety of special holiday activities throughout much of December. Designed for all ages, these activities include cookie decorating, craft workshops such as sock puppet making and snow art, themed family challenge races, all included in the resort's vacation package. Santa will join children each Saturday around the resort's village bonfire for complimentary hot chocolate and cookies. A weekly Winter Carnival features music, food, games and the thrill of watching an ice carving specialist unveil a masterpiece. A torchlight parade and fireworks follow the carnival. Smugglers' vacation packages also include mountainside condominium lodging, lift tickets, snow tubing, ice skating, use of the indoor pool and hot tub and indoor FunZone with climbing inflatables, and family and adult entertainment. Every day's a pool day at Great Wolf Lodge—even during the Christmas season—as North America’s largest family of indoor waterparks celebrates the holidays with its annual Snowland event, complete with life-size gingerbread houses, letters to Santa, caroling, and other festivities. Of course, families also get unlimited access to an enormous indoor waterpark with water slides, raft rides, interactive splash pads, surfing simulators, a lazy river, a wave pool, and more. A visit to Colonial Williamsburg during the holidays offers a wonderful chance to step back in time to see how Christmas was celebrated two centuries ago. The living history park's historic buildings are decorated with wreaths, garlands, and candle-lit windows that add a warm glow to evening walks. The season's calendar is filled with hundreds of special events, activities, and dining experiences. The holiday season kicks off in mid-November at four Gaylord Resorts with the return of ICE!, the award-winning icy attraction and six-week-long Christmas celebrations. ICE! is hand-sculpted by 40 international artisans and kept at a chilling 9 degrees! With more than two million lights and enormous Christmas trees plus the wonderful ICE! exhibitions, families will feel at home for the holidays during their visit to any of the four Gaylord Resorts located in National Harbor, Maryland; Kissimmee, Florida; Nashville, Tennessee; and Grapevine, Texas. This holiday season, guests can experience ICE! featuring A Charlie Brown Christmas (at Gaylord National), ICE! featuring the Dr. Seuss classic How the Grinch Stole Christmas! (at Gaylord Opryland), ICE! featuring A CHRISTMAS STORY (at Gaylord Palms), and ICE! featuring Rudolph the Red-Nosed Reindeer (at Gaylord Texan). Looking for a Christmas getaway in the Florida Keys? The 60-acre Hawks Cay Resort, a premier family destination in the Florida Keys, offers a seasonal Hawks Cay Christmas program of activities and a special holiday package. Seasonal activities for kids include Christmas cookie decorating, hot chocolate and story time with Mrs. Claus, writing letters to Santa, creating family holiday cards and meeting Santa, who is known to hang out at the resort on vacation before he prepares for the big day. One of the "10 best places to spend Christmas," according to CNN, the tiny town of Santa Claus, Indiana, boasts the world's only post office offering a "Santa Claus" postmark. Street names include Christmas Boulevard, Candy Cane Lane, and Mistletoe Drive, and you'll find over 20 statues of Santa around town, offering many seasonal photo ops. For the eighth holiday season running, Christmas at the Princess returns to the Fairmont Scottsdale Princess from Thanksgiving to New Year's. Enjoy all of the holiday festivities, including more than three million twinkling lights, fireside s'mores, outdoor ice skating, a visit to Santa's workshop and more. There are several special packages available for this event. From late November through early January, Suncadia Resort in Washington's Cascade Mountains is getting in the holiday spirit with its annual Winter Wonderland celebration packed full of cold-weather fun, including tubing, ice skating, cross-country skiing, snowshoeing, carriage rides, snowmobile tours, and even winter fly fishing. Holiday traditions include visits to Santa's Workshop, elf tuck-ins, and a Christmas Day buffet. In Pennsylvania's Pocono Mountains, the uber-family-friendly and all-inclusive Woodloch Resort is putting on an Olde-Fashioned Holiday on weekends in December. Highlights include a visit from Santa with live reindeer, a festival of lights, fireworks, holiday scavenger hunt, traditional yule log hunt, gingerbread wars, ornament making and more. Less than two hours north of New York City in the Catskills, all-inclusive Mohonk Mountain House is a Victorian castle in the sky that's perfect for a midweek escape during the holiday season. During the Olde-Fashioned Christmas, the resort decks its halls with spectacular handmade swags, elaborate gingerbread creations, and decorated Christmas trees. Special seasonal activities include a family Yule log hunt, holiday craft-making, and caroling. The December Delight package includes accommodations, two meals per day plus afternoon tea and cookies, and most activities.